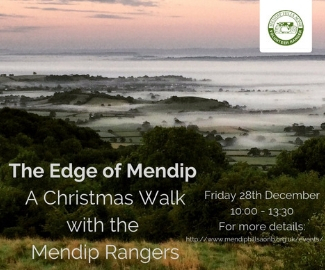 Let the Mendip Rangers lead you to the edge of the Mendip Hills where you’ll get the BEST views of Somerset, weather permitting! You’ll be skilfully led through nature reserves where the rangers can tell you about the history and wildlife while you soak up the views. There will even be a festive surprise along the way and you’ll end up in the Queen Vic pub for a free drink. Meet on Priddy Green, by the hurdle stack. Wear clothes and footwear suitable for wet, wild and windy Mendip walk. No trainers!